On March 8, Prime Minister Justin Trudeau delivered an apology to Inuit communities on behalf of the rest of the country for the government’s treatment of Inuit victims who were affected by the tuberculosis (TB) epidemic in the 1940s to 1960s. “We apologize to those who were forced to leave, those left behind, the families without knowledge of the fate of their loved ones, and the communities that continue to feel the impacts today,” said Trudeau in his official statement. Epidemic tuberculosis was introduced to Indigenous populations by European colonizers in the 18th century, though the disease did not spread to northern communities until the 19th and 20th centuries. According to the Canadian Public Health Association, death rates among First Nations people in the 1930s and ’40s were “among the highest ever reported in a human population,” at over 700 deaths per 100,000 persons. The death rate was over 10 times higher for children living in residential schools, at a staggering 8,000 per 100,000 children. By the 1950s, the disease had spread to as much as one-third of the Inuit population. 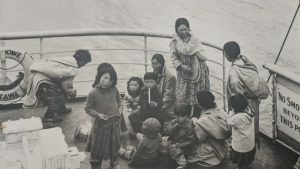 The crisis was exacerbated by housing shortages as the traditionally nomadic Inuit were forced into static communities, resulting in overcrowding in poorly-ventilated buildings. Families were forcibly separated by doctors who sent the patients to southern parts of the country. Patients were not allowed to collect their belongings or meet with their family before being taken. Once in the south, patients were relocated to sanitariums where they received largely dehumanizing treatments, including electroconvulsive therapy experimentation. Families often weren’t informed if loved ones passed, and rarely knew where their relatives were taken to. Many Inuit people were buried in unmarked graves. A government initiative developed in partnership with Inuit communities has been launched to seek out information on missing victims from the time period. The Nanilavut Initiative (“Nanilavut” meaning “let’s find them” in Inuktitut) aims to connect families with this information. It will also extend support to Inuit-led efforts to eradicate TB across Inuit Nunangat (the Inuit Regions of Canada). According to the Canadian Public Health Association’s website, overcrowded housing in Indigenous communities continues to pose a risk today for the spread of TB, in addition to factors including diabetes, HIV, and substance abuse that also increase the likelihood of contracting and spreading the disease. Systemic improvements in medical care, access to resources, early detection, and all socioeconomic conditions are needed to effectively combat TB in these communities. The Other Press interviewed Sahara Tom, Indigenous Students’ Representative at Douglas Students’ Union. Tom is Carrier-Sekani from Lake Babine Nation and is currently in the Sport Science Program with a specialization in Kinesiology. Tom felt that Trudeau’s apology failed to adequately encapsulate the scope of the injustices faced by Indigenous populations at the hands of the Canadian medical system. Tom discussed “Indian hospitals” built in 20th century where patients were admitted based on Indigenous status and not disease. The hospitals functioned as a means of racial segregation, though their existence was publicly justified as a method of isolating TB. The hospitals were underfunded, overcrowded, and poorly-equipped, and patients were at the mercy of non-Indigenous staff who often subjected them to mistreatment and abuse. Indigenous people were essentially incarcerated in these institutions; according to the Canadian Encyclopedia, “The Indian Act was amended in 1953 to include the Indian Health Regulations that made it a crime for Indigenous people to refuse to see a doctor, to refuse to go to hospital, and to leave hospital before discharge.” Those who violated these regulations were arrested by the RCMP and either sent back to the hospitals or imprisoned in jails. It may seem to some that Canada has moved past such issues, but not much has really changed. Housing crises and lack of adequate medical care still plague many Indigenous communities, especially in the north. Indigenous people are still suffering at the hands of the medical system—a class action lawsuit was filed by 60 Indigenous women in Saskatchewan last year alleging they were forced to undergo unwanted sterilization surgeries and treatments, with some cases occurring as recently as 2017.